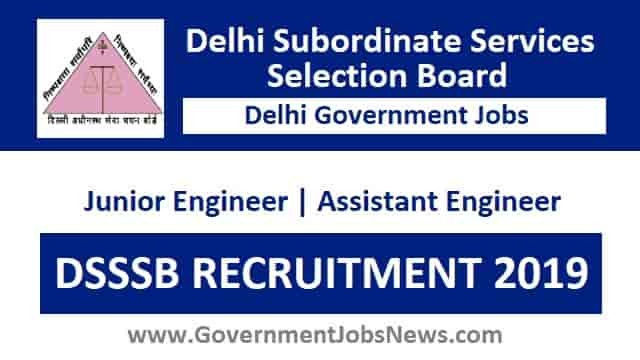 DSSSB Recruitment Junior Engineer Assistant Engineer Online Form 2019: Delhi Subordinate Services Selection Board (DSSSB) has published notification for the Recruitment of Junior Engineer "JE" and Assistant Engineer "AE" for civil and electronic streams. the link will be disabled. Interested Candidates find important details given below and read the notification carefully and can apply online. Diploma in Civil/ Electrical Engineering with 2 Yrs. Experience. Diploma in Civil Engineering Only for the post of JE Civil in NDMC. Asstt. Engg. (Civil) in MCD: Not exceeding 30 years. Junior Engineer (Electrical) in DUSIB 18-27 years. Age relaxation will be applicable for reserved categories as per govt rules. 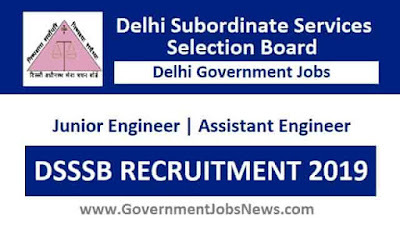 Candidates have to appear in one One-Tier and Two-Tier Examination Schemes for the post of Junior Engineer "JE" and Assistant Engineer "AE" for civil and electronic streams. You are advised to read official Notification for the Schemes or Syllabus for DSSSB JE and AE posts.